California Caster offers a wide range of quiet, non marking, easy to roll ergonomic casters and wheels for all types of medical equipment; for both OEM's and replacement needs. We provide casters that reduce the noise levels, protect floor surfaces and prevent injuries to staff. Medical caster applications include, but are not limited to, IV poles, computer stands, chairs, stools, crash carts, overbid tables, ultrasound & x-ray carts, case carts, surgical instrument carts and hospital beds like Hill-Rom and Stryker. We can offer non-Magnetic MRI applications that are compliant in all hospital facilities. We supply casters and wheels for all kitchen equipment used in hospitals, nursing homes and long-term care operations. California Caster can help reduce the time you spend searching for the right replacement casters while saving you time and money. Before a purchasing decision is made, please take the time to compare our prices to the national catalogs. 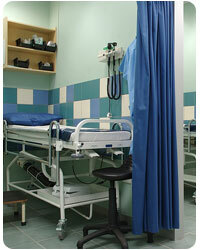 Listed below are a few of our more popular casters used in the hospital industry. If you would like to consider additional options, please click here to view our full line of casters. California Caster specializes in designing custom solutions to meet the most stringent application requirements. Our design team is available between 8:00am - 4:30pm (PST), Monday through Friday and can be reached toll-free at 800-950-8750. You may also contact us via email at customerservice@californiacaster.com.